"Alexandrian Theatre?" It's kind of a pretentious title, yes, but hopefully the "re" spelling of theater/theatre, in this context (my blog), kind of defuses the snootiness and makes everything seem a little more absurd. Basically, the point of this "series," which I'll update as necessary, is to keep an index of the more impressive references I notice in different media. Today's particular reference is one that sort of jumped into my mind about a week or so ago; I ended up having to spend quite a bit of time thinking about it before I could remember its source. But remember I did! Hopefully with this little series, though, I won't have to remember--I can just check my blog. YOU, on the other hand, get to find out about great books/movies/video games/TV shows you should be experiencing and (perhaps) aren't. One more thing, then I'll get right to the reference, and it is a great one. What about this "Alexandrian" thing? Well, Alexandria was the site of the famed library in antiquity, and the city's name was eventually pulled into a term used to denote those pieces of Hellenistic-era literature that are generally learned and particularly hyper-referential: anything by Callimachus, Theocritus' Idylls, or Apollonius' Argonautica, to name a few. So here I'm concerned with modern artistic (well, more or less so; I tend to think of "art" as broadly applicable) creations that reference other works and so situate themselves within a cultural or chronological context. So. Scott Pilgrim and Ninja Gaiden. Bryan Lee O'Malley, the author of the Scott Pilgrim books (Canadamanga? ), is kind of a modern Callimachus in his own right. Each of the Scott Pilgrim books places itself within a culture of which the books' protagonist is a part, with references to movies, rock music, video games, and other pop culture items. 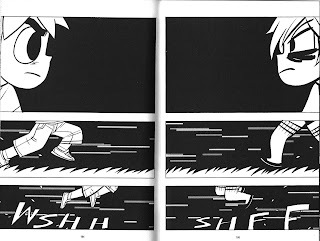 One persistent gag has Scott Pilgrim, said protagonist (obviously! ), gaining experience points (XP) for various accomplishments in the narrative, creating the conceit that Pilgrim is a character in a role-playing game, though O'Malley deploys this gag at his convenience and not as an integral feature of the books. Or maybe it is an integral feature, as conflict is incorporated into the narrative in a very strange way. You should read the books and see for yourself. Anyway, this creates a strange setting for the story, where the boundaries between the books' "real" world and the sort of "interior" world of Scott's emotional responses to events overlap. It's basically a Walter Mitty scenario, except that the products of Scott's imagination are constantly appearing in the real world. So it's kind of like Walter Mitty + Sphere, except Scott's imagination is not the cataclysmic tool than the imaginations of the characters in that novel/movie are. I'd be concerned here about spoiling Scott Pilgrim for you, except this is a constant feature in the books, and I don't think my telling you about it outright can have any real negative effect. MAYBE my mentioning this will encourage you to buy and read the books, which you absolutely should do. Okay, now the real meat of this post. Let me shift gears, okay? Did you ever play Nintendo? Say, in the 80s? 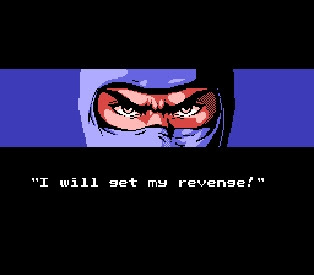 There was this great game for the Nintendo--by which I mean the old NES/Famicom--called Ninja Gaiden. As a game in the 80s was likely to do, it featured a ninja as its protagonist. This particular ninja, Ryu Hayabusa, was out to avenge his father's death and eventually found himself embroiled in a conspiracy to summon a terrible demon and bring about the apocalypse. Something along those lines. Now, this is of course a preposterous (and, alas, awfully cliche) plot, but it's also pretty substantial for a game from the 80s. Remember that console games of the era were largely cast in the Donkey Kong/Super Mario Bros. mold: rescue the princess/girlfriend/whatever. Point A to Point B, in terms of narrative. Ninja Gaiden distinguished itself not only by having a much stranger overarching plot but also by employing short cutscenes in between chunks of gameplay that explained why Ryu was, say, fighting his way through a mine. This wasn't anything new in the world of video games, but for a console game, and particularly for a console action game, this was pretty novel. This was quite a step forward for video games. 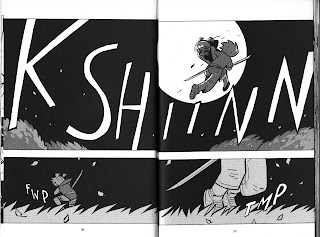 Granted, Donkey Kong had already done the whole "games can have narrative, too" thing, and The Legend of Zelda, Metroid, and Kid Icarus had sort of perfunctory text-based intros, but Ninja Gaiden went the extra mile and created an almost comic bookish mixture of text and static image. And of course there was the fight between the two ninjas, which was actually animated and quite dramatic, even by today's standards. Beautiful, isn't it? Now what are you waiting for? Go read Scott Pilgrim!